Sophisticated but not elitist … this is how Thomas Schulte, the owner and managing director, sees next home collection. Maybe it was this premise that, instead of pinning ones hope on important names to help a new company along, made working with young and yet unknown designers easier. The decision was courageous but proved to be a smart one. 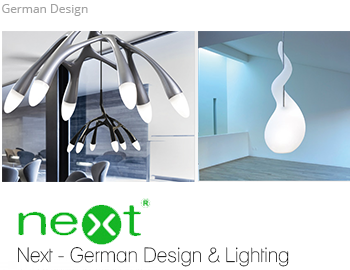 Already at next’s first light+building in 2000 did three of their products win the “Form 2000-award” of the German Crafts Association (Bundesverband des Kunsthandwerks). Soon after, Liquid_Light received the award “Design for Europe 2000″ at Interieur trade fair in Belgium. It seemed as if Schulte’s wish “to be available for everybody” was coming true. In the following years he expanded the collection in an increasingly close cooperation with the design studio Büro für Form. Thus he managed to draw a connection from products that work with a tongue in cheek (like Dicke Trude and FlipFlap, for example) to luminaires that convince with their functionality . “With the direction of the collection I like people to feel comfortable with our lighting. I want next to offer contemporary design and to create a suitable atmosphere whether at private homes or at architectural projects”, Thomas Schulte explains. The manifold applications of next luminaries prove him right.